New competition for young musicians in the East Midlands – the winner! Emily Hodkinson pictured with John and Barbara Beaumont. 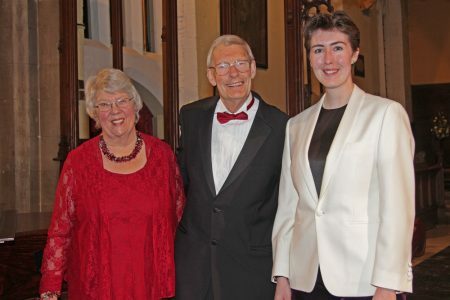 Bingham and District Choral Society has launched a new Bursary and Prize open to young musicians (aged under 24 years) across the East Midlands. The final was held in Bingham on Saturday and featured five outstanding performers: a cellist and four singers. Ranging from Boccherini to Britten, the wide repertoire on display was impressive for its ambition and mastery. The difficult task of selecting the winning candidate fell to a panel of four experienced judges. Emily Hodkinson, a mezzo soprano from Nottingham, emerged as the winner. Her confident and elegant performance comprised works by Gounod, Brahms, Purcell and Hahn. She was accompanied by Angela Foan. Emily will receive a Bursary of £500 to help develop her musical career. This has been generously funded by the Patron of Bingham and District Choral Society, John Beaumont, and his wife Barbara. In addition, Emily has been awarded a Prize in the form of an opportunity to perform with the choir in the future. In second place was Ben Watkins, a bass from Nottingham, while Katharine Ley, a cellist from Lincolnshire came third. The competition is an exciting new departure for the Choral Society. It is an opportunity to increase our community involvement by helping local young talent to flourish.